Pong is a game that needs no introduction whatsoever, so I won’t provide one. We’ve all played Pong since it’s either been bundled with other games, or is so freely available on the internet that I’m surprised Microsoft and Apple don’t include an advertisement filled version with the newest install of their operating systems. I won’t be looking at any modern iterations of Pong though; I’m looking much further back, further than I’ve ever gone before. 1976, the APF TV Fun Model 401 is released, and quickly becomes one of the most popular Pong Consoles on the market behind Atari and Magnavox’ offerings. It contains four games, the standard Tennis, Hockey, Squash, and Handball for the Larry Loners. It had features like selections for bat size, ball speed, and angles of deflection, which is nice and keeps things from getting too boring. This is the Pong we all know and love since it came on the AY-3-8500 chip, which was the gold standard for cheap Pong Consoles, and was used in a ridiculous number of them. 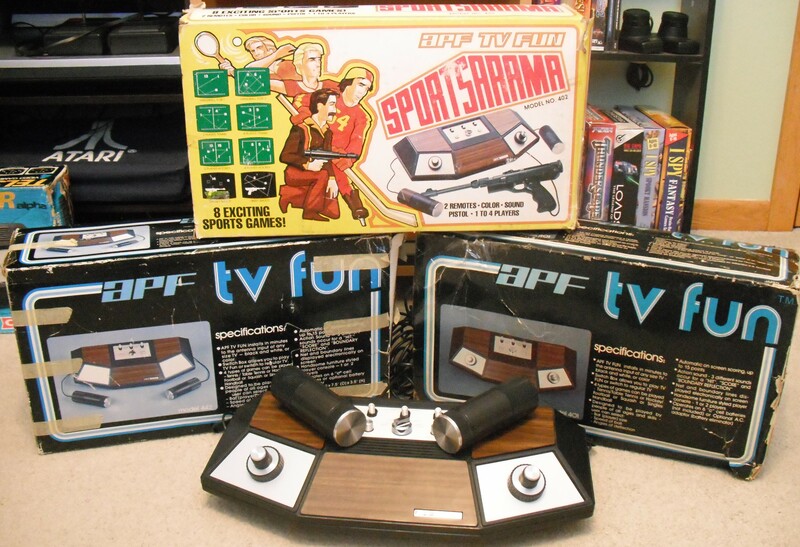 I have three APF TV Fun consoles, a Model 401, a Model 402 (Sportsarama), and a Model 442. All three of these machines have several differences, so I’m going to figure out which one is the better of the three and is actually worth buying. We shall start with looks, how do these consoles look? Well in two words… the same. All three of the consoles share the same woodgrain wedge design, with the game control panel at the top in burnished silver or aluminum. The only major cosmetic difference that arises is with the Model 442 which only had wired external controllers, and thereby lacked the two controllers built into the front of the machine. When it comes to the back of the machines where all of the wires usually go it’s a different story for all three machines. The Model 401 has only a plug for the power supply, while the Model 442 has a plug for the power supply and two plugs for the two controllers. The Model 402 has the most complicated backside with the aforementioned power supply and controller plugs but with an added plug for the included light gun. While we’re on the topic of the light gun, I think I need to say that (A) mine doesn’t work sadly (B) the plug it uses is the same size as a C64 power plug, so you can plug it into your C64, and © this thing looks real, so real that from a distance it actually looks convincing, don’t take it outside somebody’ll call the cops on you. The games themselves are standard AY-3-8500 Pong, at least on the 401 and 442 Models, but the Model 402 uses an AY-3-8500 and pairs it with the AY-3-8515 which gives the games color, and both of the light gun games are accessible, they are on the 401 and 442 but you just can’t access them. I don’t really think that I need to describe the sounds or the graphics since we’ve all seen and heard them before. The sounds come from the machine and not the TV which is a bit of a bummer since I usually have my volume up pretty high and these things seem to output a healthy amount of white noise which may or may not be deafening. All in all these are pretty good machines, they’re durable, and are built like tanks, even if the plastic shells are quite flimsy. The only problems you’re going to have with these machines are the controllers themselves, there are two problems that you’ll face. The first is the most common, these things are old and if you thought Atari Paddle Controllers haven’t aged gracefully wait until you see these things it will take a lot of back and forth movement to loosen up the grime of ages, and if you can get a little contact cleaner, rubbing alcohol, or other type of lube in there you’ll help things along immensely. The second issue is far less common but probably more annoying, complete lack of controllers. Let me explain, when I purchased my Model 402 it lacked the two wired controllers, I assumed that the player 1 and player 2 controllers were the ones build into the console since the machine can have up to four players. As you can guess I was wrong, and was unable to play the machine until I just bought another console that had them (the 442). I believe the consoles are compatible with the standard Atari/Sears detachable Pong controllers; they at least have the same plugs. If you’re looking to buy a TV Fun I would recommend getting a Model 402 Sportsarama, it’s got the light gun (hopefully working), color output, and is four players, it also has the nicest box. TV Fun’s are all over Ebay and usually you can get one in a box that is only mostly destroyed for 30-40 dollars, though some enterprising sellers are trying to sell loose machines for that as well. A warning to everybody who wants to build up a Pong Machine collection, don’t. These things take up an ungodly amount of space, they are ancient and many don’t quite work the way they should anymore. There seem to be an infinite amount of these things from a billion different companies you’ve never heard of before. My recommendation is to buy the one you want and never buy another; seriously, almost all of these things have the same chips inside them anyway. The only reason you should buy another is if it’s something that has never been seen before, or is something quite rare that is being offered at a very low price which you can then resell for a profit. Don’t get into pong, please, they’ll just gouge you on shipping. If you eventually win the Million Dollar Pong TV show announced by Atari a year or two ago, you might be able to afford both a few more Pong systems and storage for those. That is assuming the game show ever will materialize and that you indeed will be able to win $1,000,000. Knowing the Atari of today I doubt it will ever happen. And since when did modern Atari have a Million dollars? Probably not Atari's money, but some other sponsor who would think it is a good concept. But yes, you're right in that have you seen one Pong game, have you seen pretty much all of them, at least the GI powered ones. Though I must admit the APF ones are rather stylish, next to Atari's own and possibly the Colecos. In comparison, APF did quite a change of style with their M-1000/MP-1000 consoles one or two years later, though perhaps fake woodgran was on its way out, just that Atari were slow to pick up the fashion trends. Edit: Or well, the 1000 series have a little bit of fake woodgrain on the sides. I remembered it as all black plastic. How much woodgrain could a woodgrain chuck chuck if a woodgrain chuck could chuck woodgrain? I like what you wrote about thinking twice about collecting Pongs. A couple of years ago I bought a Bentley Compuvision (which was the one I had as a kid). It's in good shape and works ok, but even that unit has a couple of issues I wish I had time to figure out and address. For a casual enthusiast like myself, and as far as more advanced cartridge systems go, it's easy to make a case for how playing the 2600 is a much different experience than playing an Intellivision/NES/what-have-you. Not easy to make the same justification for Pongs. As you said, most of these units are likely to arrive with issues. I'm not as good at fixing and improving the design as some of the brilliant minds here. I find it sound advice for me anyway so I appreciate that. Issues galore! Turns out my model 442 has an incredibly unfortunate problem! The player 2 bat is completely black, you cannot see it. I originally chalked it up to the machine being cold as I've had issues with my systems being cold before that were fixed when they warmed up, but not so here. I guess it would make for a decent handicap otherwise the system is pretty much useless.